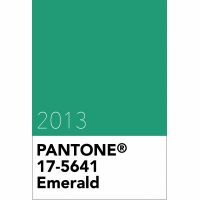 Pantone 17-5641 Emerald is a lively, radiant, lush green and is the Pantone Colour of the Year for 2013. A vivid verdant green, Pantone Emerald enhances our sense of well-being by inspiring insight as well as promoting balance and harmony. Most often associated with precious gemstones, the perception of emerald is sophisticated and luxurious. Since antiquity, this magnificent hue has been the colour of beauty and in many cultures, new life. Green is the most abundant hue in nature, so the human eye sees more green than any other colour. Pantone Emerald brings a sense of clarity and rejuvenation, which is so important in today's complex world. This powerful and universally appealing tone translates easily to both graphics and textiles. Pantone 17-5641 Emerald is from the Pantone Fashion, Home + Interiors colour library.